This entry was posted on July 27, 2006 at 12:05 pm	and is filed under Cebu, Churches, Minor Basilicas, National Historical Landmarks. You can follow any responses to this entry through the RSS 2.0 feed. You can leave a response, or trackback from your own site. Basilica Minore del Santo Niño (sometimes also called Basilica del Santo Niño) is a 16th century church structure in the heart of downtown Cebu City, Philippines. It is build in the exact spot where the image of Santo Niño (the Black Holy Child Jesus image/sculpture) was found by the Spanish conquistadors in 1565 preserved in a burned wooden box which was left behind by the Portuguese and Spanish explorers in 1521. The church of Santo Niño de Cebu was first founded by the Augustinian priest, Andrés de Urdaneta on April 28, 1565 . The first church structure was built out of earth, hard wood and nipa in 1566 ordered by Fr. Diego de Herrera. 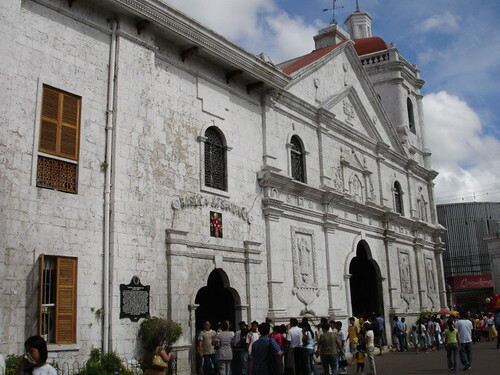 In 1735, Fernándo Valdés y Tamon, the Governor of Cebu, ordered the church to be constructed by hard stone, which was build in the same spot were the previous church stands. Constructions finally finished in 1739. In 1965, during the fourth centenary of the Christianization of the Philippines, Pope Paul VI elevated the church to the rank of minor basilica. The Basilica remains under the care of the Augustinians.